Historic diving platform replaced with replica after an incredible 135 years of service! Dive in……John pictured on the dale. THE iconic Western Baths Club has taken delivery of a new diving platform after the original lasted an incredible 135 years! Known by its original and historic name, the diving “dale” was replaced thanks to the generosity of one of the members at the renowned Baths. 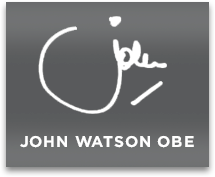 John Watson OBE provided the funds to replace the original cast-iron one installed in 1878 two years after the Baths in Cranworth Street, Hillhead opened. The option of replacing it with a modern one was rejected in favour of commissioning an EXACT replica in keeping with the Bath’s renowned Victorian surroundings. It was made by ornamental ironwork manufacturer Walter MacFarlane and Co whose Saracen Foundry in the north of the city also produced the ironwork for the Kibble Palace in Glasgow’s Botanic Gardens. Like The Western Baths Club, Walter MacFarlane and Co can trace its history back to the mid 19th century and was the ideal choice to create the new dale. 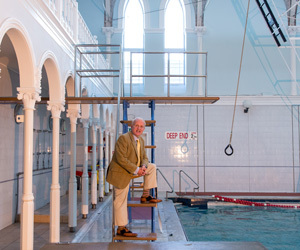 John said: “I am delighted that we have been able to create the new diving dale which will be of great benefit to the many members of the Western Baths Club. Fraser Makeham, General Manager of the Club, added: “The original diving dale was corroding and clearly past its useful life. Everyone would agree that it has served the Club well and after 135 years was due its retirement.